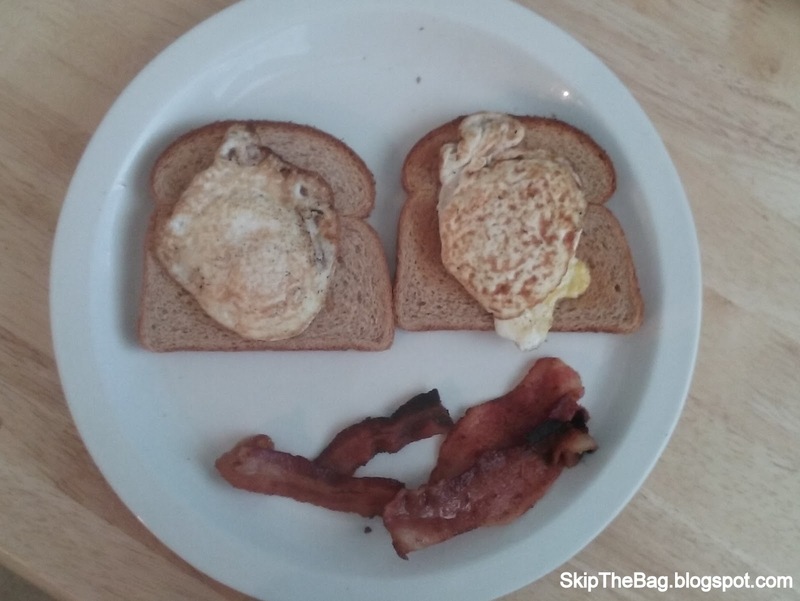 Skip The Bag: We Have Eggs! Shortly before Easter Hubby and I took the plunge and got chickens. You can read about when we first got them, the coop we built, and how easy they are to keep. 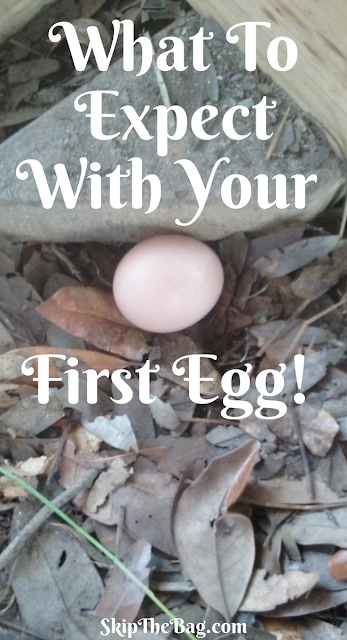 Chickens start producing eggs at about 20 weeks so the first week of August our egg watch began. Every day we would go out at least once a day, if not twice just to see if there were any eggs. We could tell they were close because they were now full grown and were clucking and squawking like they wanted to lay eggs, but they just weren't doing it. Well last Wednesday I was off work and walked out to the coop about noon to check on them and give them a treat. They usually all run toward the door when they see Hubby or I come outside because they either want let out of the coop or to eat the treats we bring them. Well rather than getting up right away one of them was laying down near the water. When I walked in I saw she was laying on an egg! I was so thrilled! Of course Hubby and I both wanted to have it, but we decided that we would wait until there were at least two eggs and we would eat them together. It was fair, but that also meant we would have to wait until the weekend. The next day Hubby was going to work late so he was the one to check on the coop, but they didn't lay. It wasn't until Saturday that they laid again. Hubby went out mid afternoon and there were two eggs! One was even in the nesting box! We are using two five gallon buckets as our nesting boxes. They are propped up off the ground and have a small ledge. When the chicks were little they would all sleep in one of them. We were afraid they wouldn't roost so we took the boxes out for nearly 2 months. Now we were afraid that they wouldn't fit in the buckets and/or that they wouldn't know to use them. But apparently our fears were a little unfounded because at least one of them has figured it out! Sunday morning when I let the chickens out I found another egg. So for breakfast Sunday morning we each were able to split the four eggs. My father-in-law joked that we only need 696 more eggs to recoup our investment! The eggs are brown and pretty small. 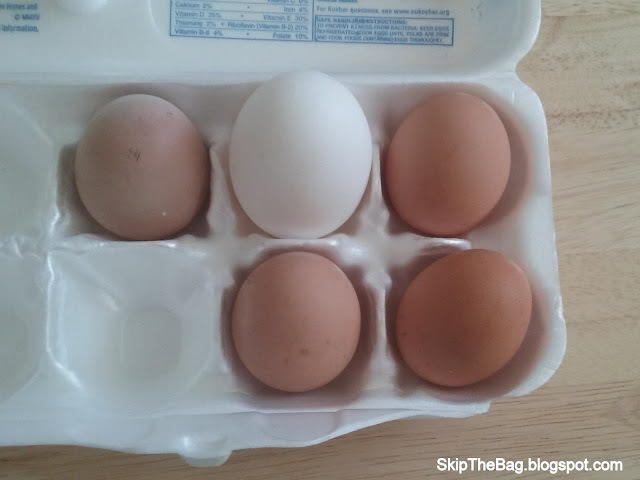 They are shown here with an extra large egg that we had from when we were still purchasing them. It's slightly hard to tell from the photo, but they are significantly smaller I'm guessing the egg is more along the size of a medium egg. I'm not sure if the eggs will get bigger or if this is just the size they will be. Hubby said the shells are much thicker than traditional eggs. I'm guessing part of that is due to the fact these are their first eggs, but also because they aren't cranked up to produce as many eggs as a production chicken. Do you have chickens? 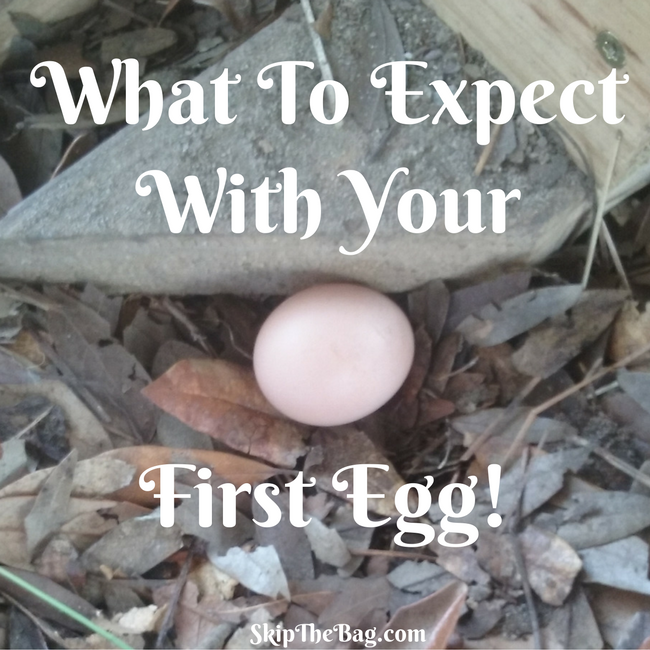 What was it like when you got your first egg? Yay!! That's so fun! They'll stay nice and hard shelled if they have plenty of calcium. And yes, they'll get plenty bigger! You'll probably even get a few double yolkers too. That happens when they're young. Double yolk?! I'll feel like I won the lottery. :) Thanks for visiting and commenting. XD Yeah for a while you'll get tons.